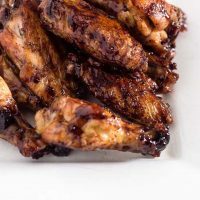 These spicy-sweet chicken wings are coated in a glaze of Smucker’s Fruit & Honey Blueberry Lemon Fruit Spread, shallot, vinegar and chipotle chili powder. It’s holiday party season, and whether you’re hosting or attending, you’re probably looking for easy, delicious party recipes. Recipes that feed a crowd, but don’t take forever to make. In family, we attend a Christmas Eve party at the house of a family friend, and just about everybody brings some kind of snack. The party starts in the early evening and goes until the wee hours, so having “heavy apps” is a must. 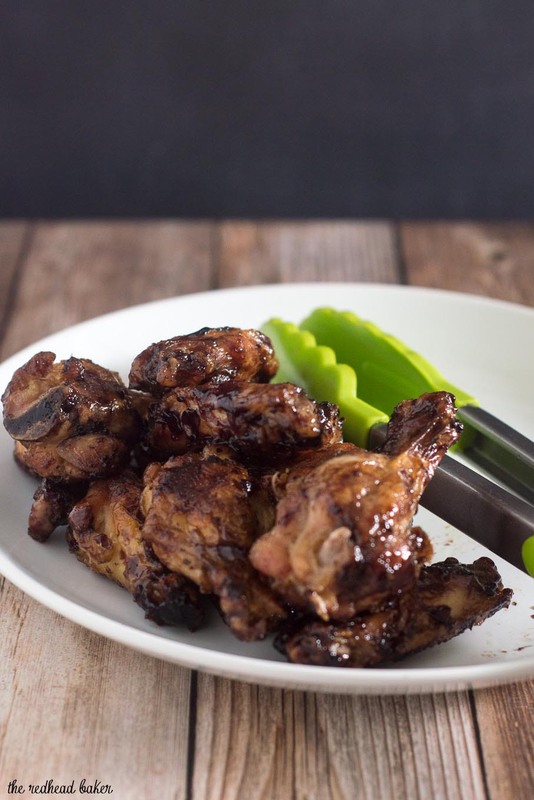 Chicken wings are a really popular at parties in my family at all times of the year: football parties, tailgates, summer baseball games on Sunday mornings, birthday parties, New Year’s Eve parties … it only makes sense to make them for the Christmas Eve party, too! 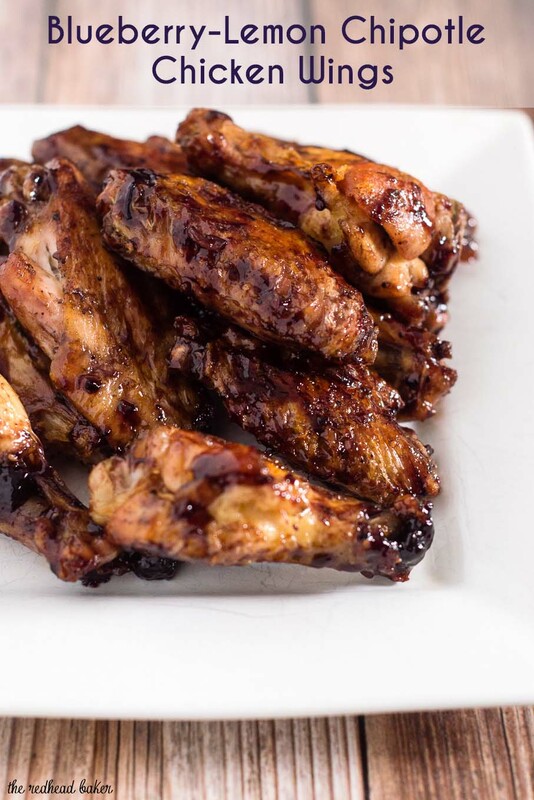 When having chicken wings that often, it’s important to change up the flavor so they don’t become boring. 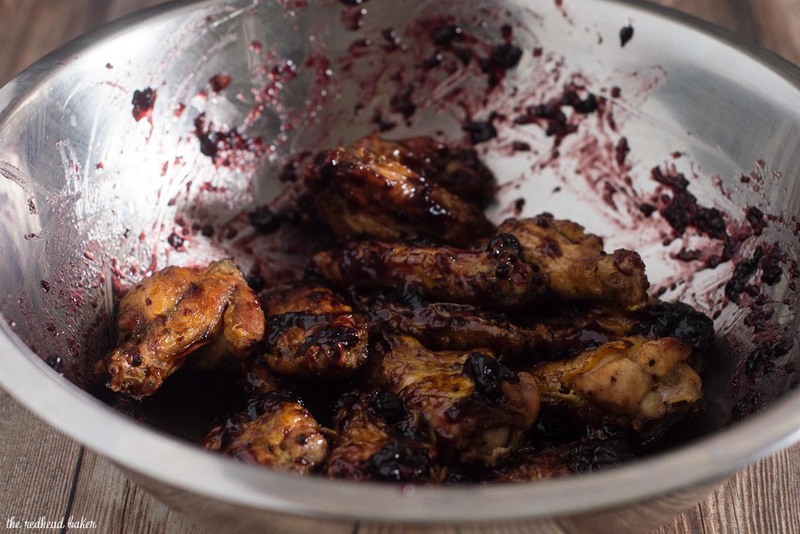 These wings have crispy skin, and a unique spicy-sweet flavor, thanks to a glaze made from Smucker’s Fruit & Honey Blueberry Lemon Fruit Spread. This recipe is so easy to make, and easy to scale for small or large crowds. 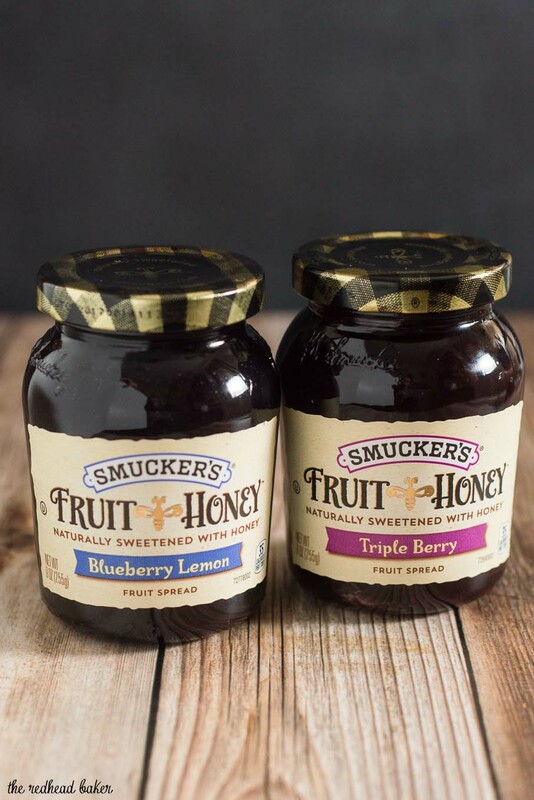 Smucker’s Fruit & Honey Fruit Spreads are naturally sweetened with honey, so no additional sugar is needed. 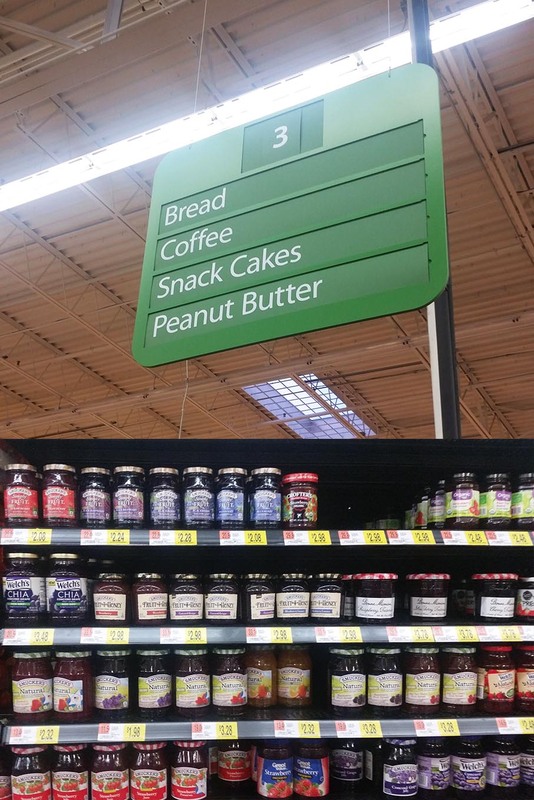 The glaze would be equally delicious with any of the other Smucker’s Fruit & Honey Fruit Spread varieties: Triple Berry, Strawberry, Strawberry Jalapeno or Concord Grape. All are available at your local Walmart. Earn $1.00 off Smucker’s Fruit & Honey Fruit Spread with this Ibotta offer. 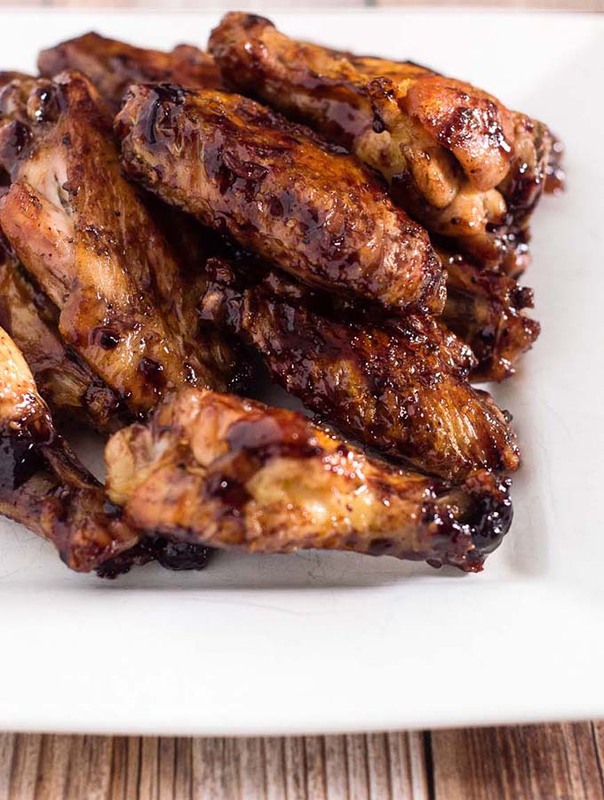 Even if you’re expecting a small gathering, you’ll probably want a big batch of these wings. You can’t stop at one helping. Even when they’re gone, you’ll be licking the delicious glaze off of your fingers. Prefer more sweetness than spice? Adjust the amount of chipotle chili powder to your taste. 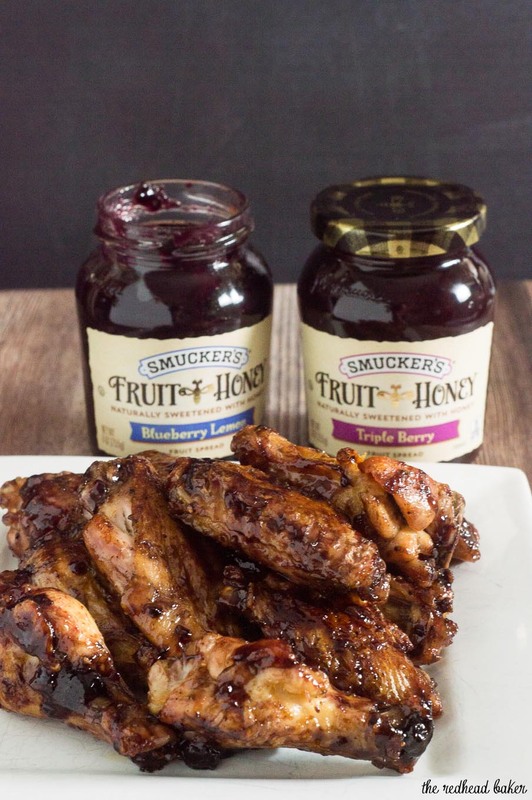 For even more easy holiday entertaining recipes, check out the Smucker’s Fruit & Honey Fruit Spreads. What’s your favorite appetizer to bring to holiday parties? Preheat your oven to 425 degrees. Line two sheet pans with tinfoil and liberally spray with nonstick cooking spray. Place the chicken wingettes in a large plastic zip-top bag. Drizzle with 4 tbsp of the olive oil and season with salt and pepper. Seal the bag and shake to coat the wings. Divide the wings between the sheet pans, leaving space between each wing. Bake for 40 minutes, turning the wings halfway through cooking. While the wings are cooking, make the glaze: heat the remaining tablespoon of olive oil in a medium saucepan over medium-low heat. Add the garlic and shallot to the pan and saute for a minute. Add the fruit spread, vinegar and chipotle chili powder. Stir until the fruit spread melts, increase the heat to medium and simmer for 3 to 5 minutes, stirring frequently, until the sauce reduces and thickens. Once the wings are cooked, transfer them from the sheet pans to a large bowl. Pour the glaze over the wings and toss to coat. Return the wings to one of the sheet pans (they can crowd together) and cook another 5 minutes. The Chicken texture & color is beautiful! Its Saucy & tempting. Made these today for the 4th of July. They were great. Thanks for sharing.